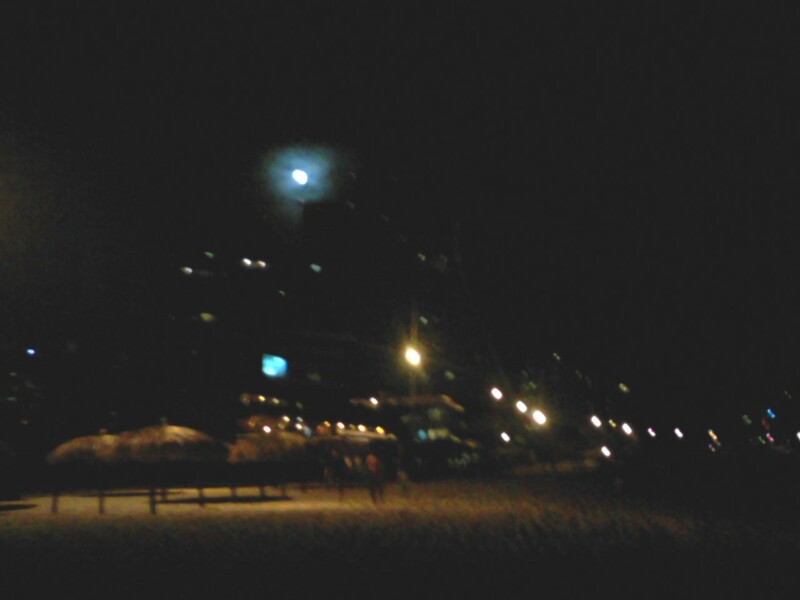 The brightest, highest round white light with bright blue around it, is the moon raising over some hotel. 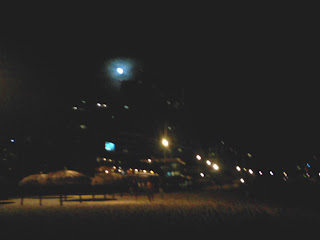 I am standing on the beach taking the photo from my camera phone! I didn't know there is so much to know about batteries. Of course being 60 years old and driving for about 44 years, in the old days, batteries were high maintenance – i.e. checking and adding water periodically – but I seem to have forgotten all I knew back in the day. My recent relationship with batteries got off to an explosive start in the very beginning when we were installing the solar system on my truck. As you know, I use the word ‘we’ loosely. Usually it is me handing Shazam the tools for her to do the work. This time Shazam was making a simple run to the bathroom. I was left in charge of tying all the negative wires together with a simple bolt and nut. I manage to melt a wrench and a few wires in the process, shooting flames and sparks all over the place and bringing Shazam out of the house at a very fast clip. Once they were installed, I put those batteries out of my mind for a long, long time. Until I needed to add water to them, in Malibu, CA. I was shocked to find out they took just short of a gallon of distilled water. After reaching México and experiencing the intense sun here, I began checking them ever week – and adding close to 4 liters of water – which is also close to a gallon. In the meantime, the red LED light on my charger was coming every day during the height of sun. It would flash red and then be solid red. No one could tell me what that meant so I decide it means that the sun is too intense. So I would turn on the electric-guzzling water pot to keep the voltage lower. Guillermo tells me now that it means the batteries are being charged to their fullest. So I've been preventing the batteries from being totally charged. Furthermore, he says I’ve been overfilling the batteries with water. There is a neck, he says, that should be water-free! Hmmm. The result is something about plates sticking together, or something sticking to the plates. The other result is that the batteries have not been getting 100% charged but only 50% or so charged. I tell Guillermo that the batteries are new, 6 months old at the most. And that the system was working and overproducing so very well, I was tempted to try to sell electricity! It’s not working well now. So Guillermo wants to return and try bypassing the inverter and charger and charging the batteries directly from the solar panels. He says the charger is reading the batteries as full when they are not. So we will try this tomorrow. And maybe Friday too. He gives me another paper to read about this 30%, 50%, 100% charging business. And I have to decide, worse case scenario, do I want to spend 3 months of my Joiyssey on batteries? Today is the day! I wake up way before the sun as usual and head to 100% Natural to blog, use their electricity and the bathroom. I am friends now with a couple of the womyn there. One has a 4 year old that is just waking up when I arrive in the early mornings. She is so cute and smart – and everyone helps to care for her. Lupita asks me about CodePINK and my work. Both womyn stare in fascination as I talk about Bush and womyn working to end war. They are so happy and so supportive. I run back to the truck to grab a couple of buttons for them before heading to the beach to stretch and watch the sun rise. I cut my time on the beach this morning because I don’t want to be late for Javier and the 5 to 10 containers (100 to 200 liters) of veggie oil – at $25-35 pesos a shot – waiting for me, supposedly. Of course, when I get there again Javier is barefoot in his grey shorts and shirt again, flooding the sandy brown painted cement floor with bleachy soapy water. I greet him and ask if now is a good time to pick up the containers of oil. He tells me I think the man I want to speak with isn’t there. I tell him I thought he was the man I want to speak with. He picks up his cell and calls and calls. Apparently no one is answering. Then Javier tells me to return on Saturday. I protest to his deep, cross-his- heart-felt promise that he will have the oil for me then. Okay. I wearily return my truck to my parking place and almost immediately Guillermo shows up. I complain to him about Javier and he tells me he used to run a restaurant and there are other people who are trying to get that oil. I am astonished. He continues to tell me that 3 or 4 people a week used to come by, looking for oil – not to feed animals but he says they were other restaurant people who would take the oil, “clean” it, and use it again. Okay. He advises me to give him some money, which I intended to do, although I don’t let on that I’ve been getting oil free. Guillermo then explains to me that he will return with his helper in a little while. He wants to try to re-charge the batteries by connecting the solar directly to the batteries, bypassing the charger and inverter. He gives me another couple of pages to read about batteries, charging 50%, and 30%, and 80% - and 100%, a percentage mine haven’t seen apparently in a long time. He is trying to save my batteries – and save me close to $1000 – if he can power them up again. At this point, I’ll try anything. I’ve eaten all the food from my fridge that would go bad, and I can live without lights – although living without the computer, that’s tough. But it’s temporary.